I wonder who I thought I was kidding, concluding my last post with the suggestion that I'd be too busy to read for the next little bit? Probably only myself. If you read Bookphilia at all regularly, you know better than I apparently do how hopelessly unable I am to resist my beloved books, no matter the circumstances. I am about 100 pages into the Pevear/Volokhonsky translation of Nikolai Gogol's Collected Tales and it's ridiculously good. I wish I had the time to simply sit and read it from cover to cover, which is something I almost never want to do with collections of short fiction; you may recall me taking 2+ years to get through volume 1 of Henry James' short fiction, for example. 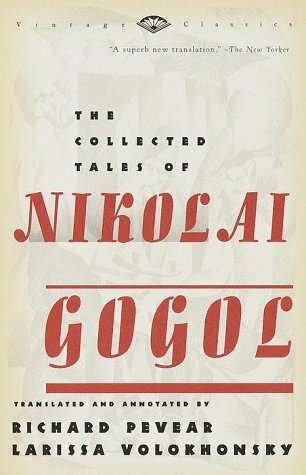 What I find particularly compelling about Gogol's stories so far, is how seamlessly the supernatural and the real or natural coexist. In "The Night Before Christmas", Gogol tells the story of the love-stricken blacksmith Vakula who is trying to convince the village beauty to marry him. 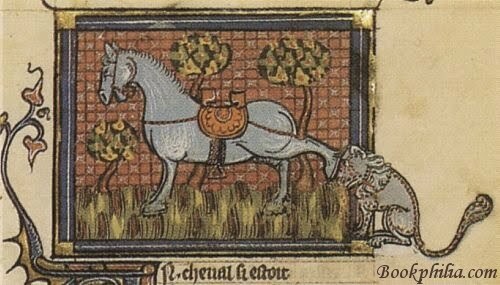 She's assigned him the Chaucerian (see The Franklin's Tale) task of getting her the tsarina's shoes as the only condition upon which she'll join with him. The devil, who's been hanging about looking for souls to tempt, see this as a golden opportunity for winning the pious young man's soul; however, as good-natured and naive as Vakula is, he manages to turn this spiritual assault to his advantage and ends up forcing the devil to take him to Petersburg to get the shoes! In Gogol's fantasy world, literally everything is alive and active; what shocks is not this busy supernatural world mirroring and mingling with our own, but how people just like ourselves behave. For while Vakula is provided with a great deal of evidence of his love's cruelty and shallowness, he finds it too surprising to be believable. It's thus not the aggressive interference of the supernatural in human lives that is problematic. Rather, Vakula is thrown off by things and people not acting according to their place and role; he believes that the natural and logical result of him continuing to woo Oksana is that she will not only marry him, but do so because she loves him. As he flies through the air, he doesn't marvel at ghosts and witches and goblins, but he does fret that "He saw so many gentlemen in fur-lined coats that he didn't know before whom to doff his hat" (p. 52). That the world and its elements, human and otherwise, behave predictably and consistently is the expectation that lies at the hear of Vakula's actions and adventures. And indeed, it also lies at the heart of Oksana's arrogance about the blacksmith, for when he fails to show up to church on Christmas day, her comfortable sense of where she belongs in the social structure is seriously upset. For Gogol, in "The Night Before Christmas" but also in the other two tales I've read ("St. John's Eve" and "The Terrible Vengeance"), it's expected that the natural and the supernatural will co-exist; it's the mystery of human motivation that baffles and terrifies most deeply. I'm just finishing Pevear's translation of The Brothers Karamazov (after reading their translation of War and Peace a few years ago); you're right, I'm sure, that it's ridiculously good! I haven't read Gogol since college, and this entices me...every time I hear his name I think of Jhumpa Lahiri's book The Namesake in which the Indian son is named Gogol. Such a fascinating novel, too, although for different reasons of course. The Namesake may very well be good (I enjoyed Interpreter of Maladies) but I don't think I'll ever be able to read it. I saw the film and it was approaching atrocious. More importantly, because film adaptations are often terrible: my husband kept pronouncing it as though it were a Japanese surname (The Na-ma-sah-kay) and we've repeated the joke so many times that I can't say "namesake" properly without mental effort. Sigh.